Volcano Inferno Review: Ratings, Pros & Cons! Home → Vape Pens → Volcano Inferno Review: Ratings, Pros & Cons! Chances are you’ve run into the word ‘volcano’ not in your atlas, but somewhere in a vapor store, in an online e-smoking forum or as you scouted the web for a bangin' electronic cigarette. Maybe you’ve never understood what it is. So know it from today on, that the Volcano is a seven-year-old Hawaii-based manufacturer of electronic cigarettes. Key areas the company remain famous for are their manufacturing standards and their design of advanced e-cigs. Volcano has held the inferno in its product range for over five years, and over this time they have polished and refined it so as to keep up with rising technologies. Being an eGo e-cigarette, expect it to be compatible with just about any cartomizer, atomizer and tank you give it. And unlike your typical e-cig, it packs powerful batteries that can last you even two days. Should you happen to have an issue with the unit within the first year of purchase, you can take advantage of their one year warranty, but bear in mind that cartridges and cartomizers are not covered. But that’s not even a fraction of all there’s to this unit. Read the rest out of this Volcano Inferno review to discover a lot more about it. If there’s something special about a metal design, it’s the fact that it is conceived with durability in mind which is what this Volcano electronic cigarette is all about. Vapor production is smooth and consistent and it gives a decent throat hit mostly depending on the flavors you choose. Speaking of flavors, you have a selection of well over 20 flavors to choose from. So it won’t be hard to find what suits you. Whereas a typical e-cigarette can last about 1-2 hours when continuously vaping, this Volcano e cig is powerful enough to go for up to 5 hours if you are using the 650mAh and if you are using the 900mAh, it can do roughly 10 hours, meaning it can last an average smoker up to 2 days without the need to charge. Considering what comes included with the unit and the fact that you are buying it directly from the company, that is in many ways good value for your money. Much as you can get a cheaper option from countries such as china, there’s the convenience and calmness that comes with knowing that you are buying a solid product from a reputable manufacturer. It’s obvious that the eGo e-cigarette is so far the most looked up to style by many veteran vapers. Other companies have always wanted a bite of this which has resulted in the creation of dozens of product that ape the inferno e-cig. 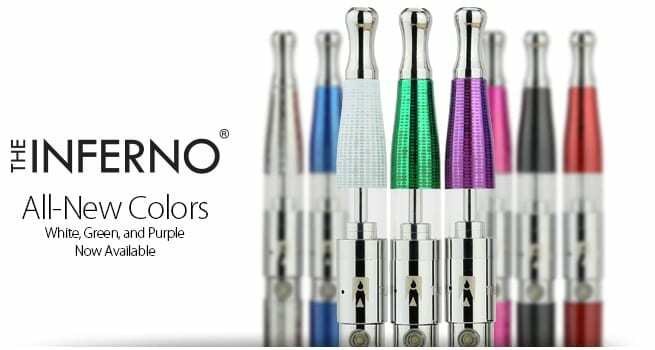 But since a good number of them want to keep the cost down, they come up with eGo e-cigarettes that lack the USB functionality and their colors look a bit dulled. But that’s where the Inferno wins. It’s uniquely styled and can operate via the USB power. Having been made out of metal, this electronic cigarette gives you the confidence that you are holding a sturdy unit. It’s been designed in a way to give you a firm grip and even after you use it for some time, you are not going to get fatigued. This is unlike the awkward shaped vaporizers with heavy construction that just make vaping difficult and uncomfortable. Volcano e-liquids come in about 29 flavors, all of them available in different nicotine strengths - 24mg, 16mg, 8mg and 0mg. What’s so interesting about them is that they taste exactly as the flavor name suggests, whether it’s Maui Mango, Shark’s Clove, Vanilla Bean, Mauna Dew or Kona Coffee. Since all of them are a perfect mix of VG and PG, each of them guarantees you a decent throat hit and huge vapor. Volcano is one of the few electronic cigarette company with a well-functioning support system catering to both prospective and loyal customers. Not only do they have a detailed section dedicated to educating users on electronic cigarettes but also instructional videos touching on how to use and take care of your e-cigarette. In addition, they do have an active blog where you can visit to learn a thing or two about what’s going on in the e-cigarette space. To contact their customer service, you can use the online live chat or give them a call or you can send a support request. If you are used to mini electronic cigarettes, you are certainly going to find the inferno a bit strange at first. While other units may simply require you to screw the cartomizer and battery together, the Inferno requires that you fill it up with an e-liquid which should be a simple process but then it can be quite messy at first. After filling the cartomizer, you will then have to feel the tube tank too. The entire process can take up to 15 minutes. Here’s where you are going to fall in love with the Volcano e-cig. It comes included with two powerful batteries: a 900mAh and a 650mAh battery. Each of them has the capacity to let you enjoy long days of vaping not worried about recharging. In addition, both of them are USB pass-throughs. Recall what we mentioned earlier in our Volcano Inferno review about styling? Great, so you can utilize your PC’s USB port and carry on with your vaping as the battery is being charged. The two are operated manually, meaning you have to press down a button while inhaling on the unit. Design-wise they look sleek and have on an inferno logo on their sides. On top of that, you have the option to pick from a wide range of colors including red, blue, pink, black and silver, making them a perfect fit for one who cares a lot about styling and taste. Here’s a unique and advanced tank able to hold up to 2.5ml of e-juice and designed in a way that makes refilling it so easy and fast. It’s so different from what you will see in other models. First off, you will fill your cartomizer tank just as always do and proceed to insert it roughly three-quarters way into this Tube tank. You will then pour in more e-liquid into this tank until its half-way full and after that push in the cartomizer as far as you can or it can go. A small hole on this cartomizer will draw in the e-liquid from this tank which will help to keep it saturated. You can then proceed to attach the drip tip at the unit’s top. Attaching this tube tank to the unit’s battery requires that you first attach the metal ring that comes included with the kit to the battery. From our Volcano electronic cigarette review, it’s clear that the Volcano Inferno e-cigarette is a solid unit packed with premium features that make it a pleasure for anyone to use. Vapor production is just right- thick and massive, and adding on the wide range of flavors, the experience gets even better. Size and simplicity were sacrificed for the sake of performance and this is what make this unit just ideal for work and home but not when you are on the move. Much effort was out to give it a decent battery life and overall, it performs exceptionally well for a unit in its class. So for its price, there isn’t much to moan about because it’s worth everything you pay for it.